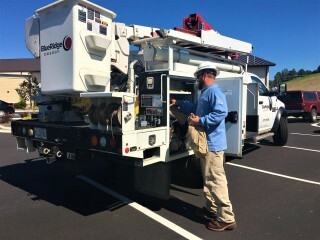 Line technicians are checking items such as chain saws and other supplies in preparation to quickly restore outages should this weekend’s severe weather damage power lines or poles. Blue Ridge Energy is prepared and ready to respond should the severe weather predicted for this weekend lead to power outages in the cooperative’s service area of Caldwell, Watauga, Ashe, Alleghany, Avery, Wilkes and Alexander counties. While weather forecasts are evolving, currently precipitation in the cooperative’s service area is expected to begin in the early morning hours of Saturday and is likely to be all snow, although a few degrees difference could result in more ice or sleet. Accumulations could be between two to seven inches. The threat of severe weather is stronger for Blue Ridge Energy’s mountain counties, particularly for Ashe County. Freezing rain could occur Saturday evening across the cooperative’s service area and continue overnight. To report outages, Blue Ridge Energy members can use the Blue Ridge mobile app or call: 1-800-448-2383. For outage status at any time, the cooperative’s online outage map is available on the mobile app or at www.BlueRidgeEnergy.com. Be sure cell phones and other electronics are fully charged or have fully charged battery back-ups. Blue Ridge Energy posts information during major outages on its social media channels: www.facebook.com/blueridgeenergy; www.instagram.com/blueridgeenergy and www.twitter.com/blueridgeemc. Blue Ridge Energy serves some 75,000 members in Caldwell, Watauga, Ashe, Alleghany, Wilkes, Avery and Alexander counties.